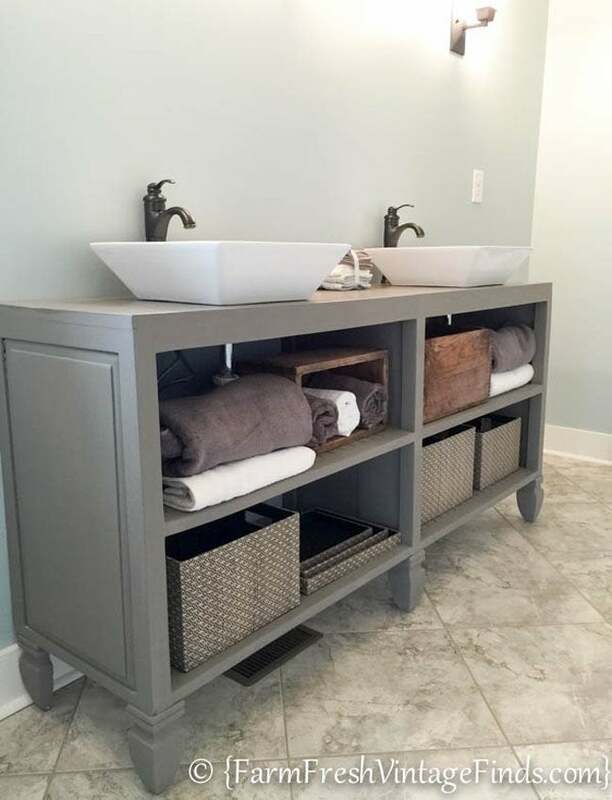 This clever blogger combined inexpensive materials to build a high-end cottage style vanity that stylishly completed this bathroom remodel. 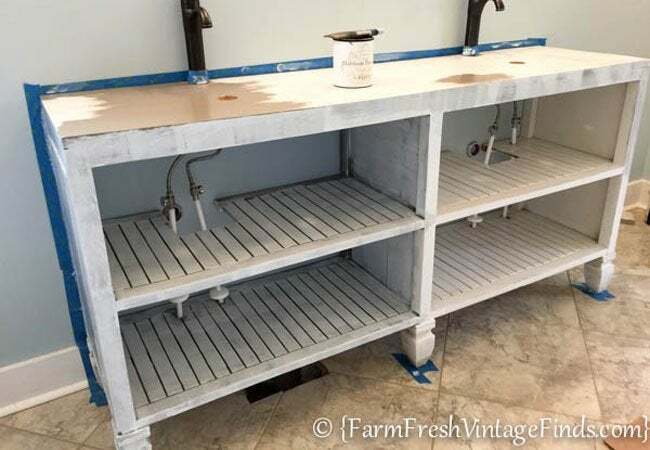 Beth from Farm Fresh Vintage Finds was determined to find an inexpensive alternative to the high-priced vanity her client’s had their eyes on. 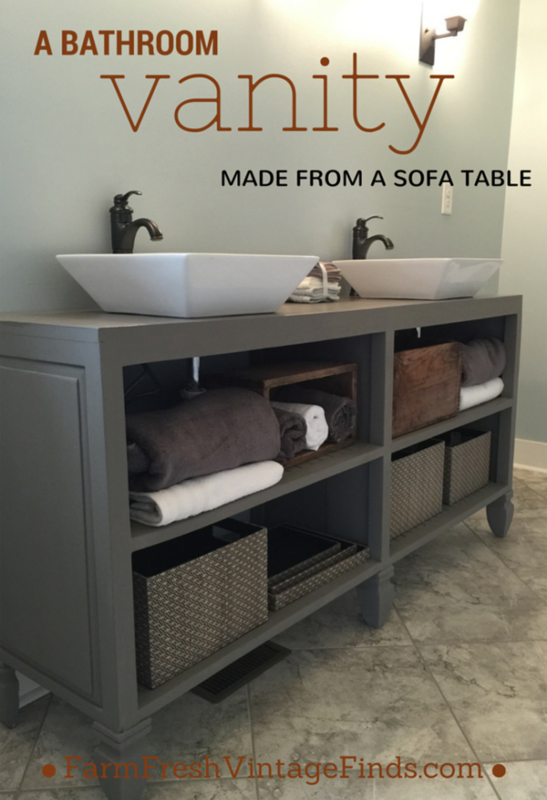 Inspiration came in the form of a sofa table and pedestal sink that she cleverly repurposed into a cottage-style custom vanity that suited her client’s tastes and budget. 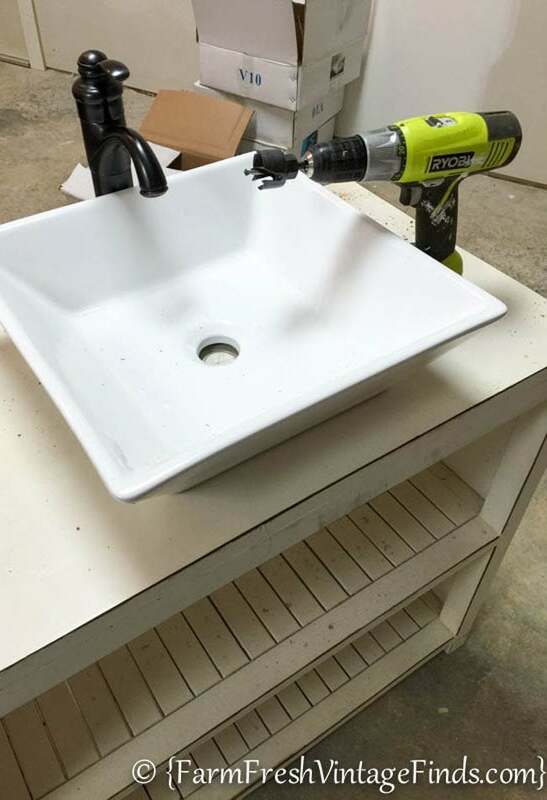 We began our project by fitting the sinks first. 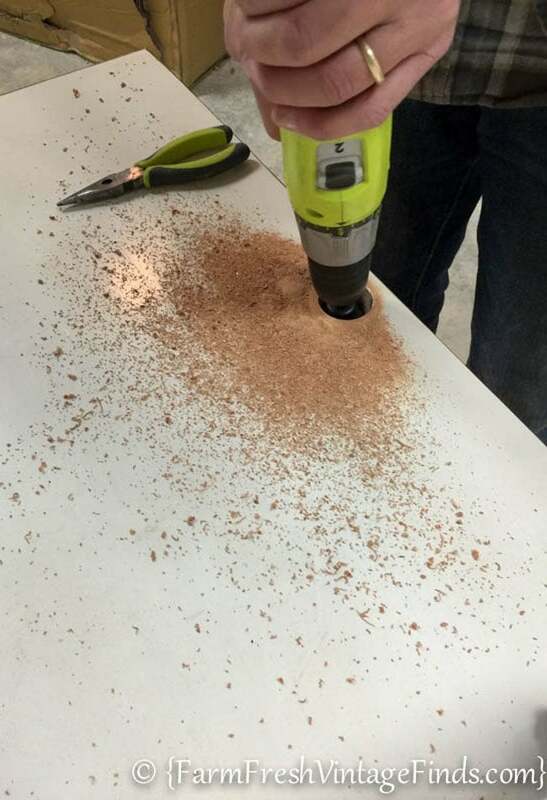 We measured for the faucets and sink placement and then used our drill to drill the proper holes. Next it was time to add some height to the bottom to raise the vanity just a bit. 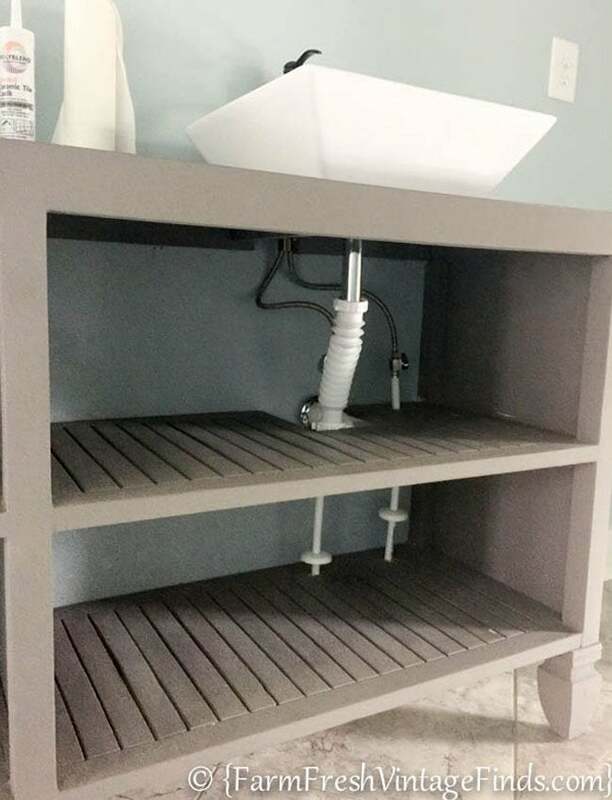 Average height for a vessel sink vanity is 32″-42″ and this cabinet was only about 28″ so we added these little babies (also known as deck post caps) to the bottom to raise it just a bit. Next it was time to install the vanity and paint it. I used Heirloom Traditions Chalk Type paint in Thunderous. Heirloom Traditions paint is a fabulous durable paint that requires minimal prepping and adheres to most any surface. 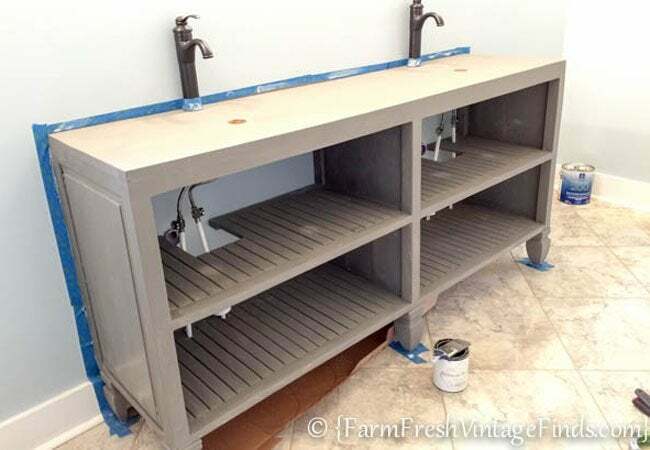 However, since this was a bathroom vanity that will get lots of use I did use a tough primer just to be safe, it’s called Salvation Solution also made by Heirloom for the DIY Paint line. I then sealed the entire cabinet with a durable top-coat of General Finishes High Performance water based Satin. Next it was time for the plumber to come in and attach the water lines and drains. As you can see we cut out some of the shelf to fit all the pluming in. Next it was time for my favorite part—the decorating! A few wooden boxes to hide the not so pretty stuff and some gray and white towels, and two pretty mirrors (not yet hung when these pictures were taken) and DONE! Thanks, Beth! 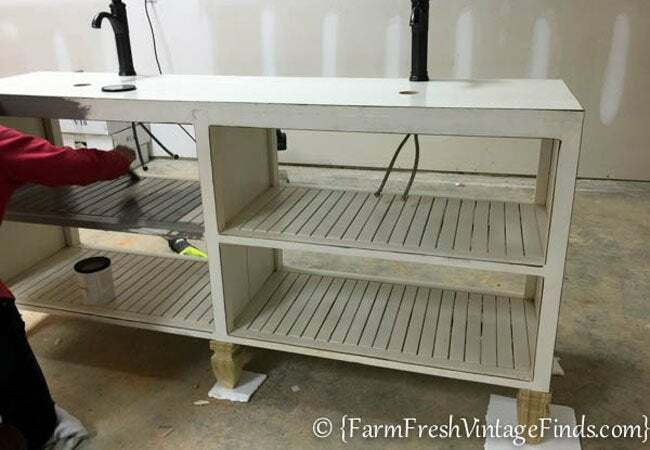 For more budget-friendly ideas, visit Farm Fresh Vintage Finds.